Low-dose CT lung cancer screening programs catch early stage disease and help reduces lung cancer mortality. But much like the mammography/unnecessary biopsy debate, questions exist with respect to unnecessary surgeries that may be performed. A study published in the October issue of the Annals of Thoracic Surgery supports the hypothesis that the incidence of unnecessary surgery is very low, and the benefits of identifying patients whose lung cancer would otherwise not be detected is far greater. Lahey Hospital & Medical Center in Burlington, MA, has a very active lung cancer screening program, which the radiology department started in January 2012. Christina Williamson, M.D., of the Department of Cardiovascular and Thoracic Surgery, and a multidisciplinary team representing radiology, oncology, pulmonary, and critical care medicine decided to assess the number of surgical procedures that were done for benign disease from January 2012 through June 2014. They used a prospectively collected database to review the records of 1,654 patients. A total of 105 patients had LungRADS 4 findings. Sixty-six patients (63%) had PET scans, 16 (or 24%) had CT-guided core biopsies, and 32 (or 30%) had bronchoscopies. 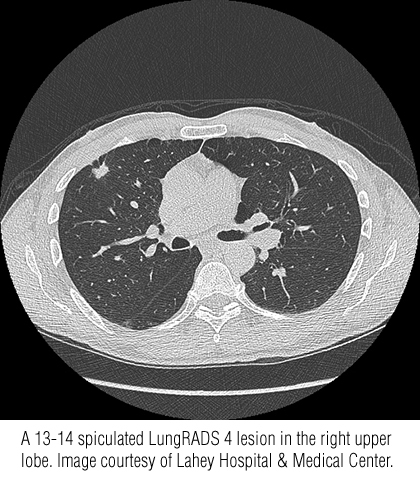 For 45 patients, follow up chest CT exams were ordered at three and six months, and for 69% of this group, nodules had decreased in size and these patients were downgraded to a lower LungRADS category. Twenty-five patients, or 1.5% of the total LungRADS 4 patients, had surgery. Twenty patients were diagnosed with lung cancer, 18 of whom had early stage disease (stage I and stage IIA). One of the five patients who did not have lung cancer was diagnosed with breast cancer metastasis. The remaining four had necrotizing granulomas and hamartomas. An additional 11 patients in the lung cancer screening program were diagnosed with cancer. Nine had lung cancer but who did not undergo surgeries. Eight of these patients underwent either chemotherapy or combined chemotherapy and radiation therapy. One patient was diagnosed with diffuse B-cell lymphoma and the other had metastatic renal cell cancer with multiple pulmonary nodules. In sum, the incidence of surgery for benign disease was 0.24%. The authors believe that this low rate is the result of two factors. One is the use of LungRADS classification criteria from the inception of the program. The other is the referral of all patients with LungRADS 4 findings to the pulmonary medicine department and the discussion of these patients at a weekly multidisciplinary thoracic oncology conference. They suggest that the development and validation of robust predictive surgical models could lower the rate of unnecessary surgery because such models may be able to standardize risk assessment and facilitate decision making. They are also hopeful that the use of biomarkers may prove to be a useful tool to help detect lung cancer without surgical intervention. Walker, BL, Williamson C, Regis SM, et al. Surgical Outcomes in a Large, Clinical, Low-Dose Computed Thomographic Lung Cancer Screening Program. 2015 Ann Thoracic Surg. ; 100: 1218-1223. Study reaffirms unnecessary surgeries not result of lung cancer screening. Appl Radiol.